Interwoven tropical flavors deliver intrigue and breezy nourishment from a natural blonde ale. But don’t be fooled by its airy approach. With assertive hops and a touch of effervescence, this versatile beer also brings depth. 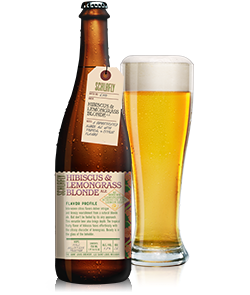 Schlafly Hibiscus Lemongrass Blonde Ale is just as comfortable around the grill as it is on a white tablecloth. The tropical flavor of hibiscus fuses effortlessly with the citrusy character of lemongrass to offer gentle sophistication. Beauty is in the glass of the beholder.